Tamika Catchings and father Harvey Catchings raise the No. 24 banner into the rafters at Bankers Life Fieldhouse. Photo by NBAE via Getty Images. 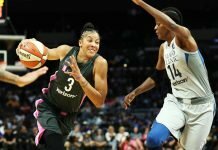 Indianapolis – In a night that was supposed to be all about the Fever and honoring one of the best to play the game, the Sparks utilized a huge second-half run to thwart Indiana’s special night, 84-73. Nneka Ogwumike led all Sparks scorers with 21 points, while Candace Parker posted 18 points and 13 rebounds. Chelsea Gray also had 17 points for the visitors. The Fever retired Tamika Catchings’ jersey in an extended halftime ceremony. Los Angeles was able to overcome Indiana’s hot first quarter by rallying from an 18-point deficit to pull within three by the end of the period. They led their hosts by six points at halftime. The Sparks began the third quarter on a 19-0 run, which gave them a 25-point lead. 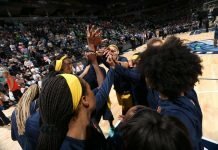 The Fever then reeled off 12 unanswered points, but Ogwumike and Parker stepped up play in the fourth quarter, especially, to bury Indiana and even the season series. Los Angeles coach Brian Agler said the team’s plan for the second half was to clean things up, both offensively and defensively. Ogwumike emphasized that being in a similar position their last time in Indiana helped ensure a victory this time around. 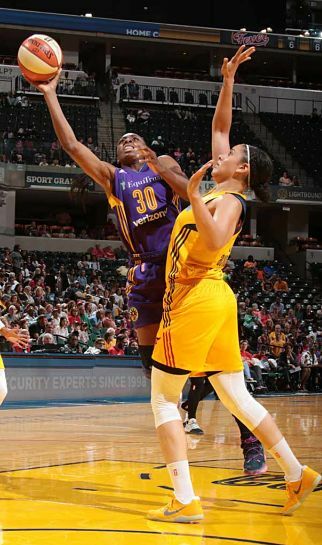 Nneka Ogwumike shoots over Natalie Achonwa. Photo by NBAE via Getty Images. The loss ended a modest two-game winning streak for the Fever. Coach Pokey Chatman said that the potency of the Sparks offense requires a near-perfect defense. Candice Dupree led the Fever charge with 14 points, while Shenise Johnson and Briann January each added 13 and Erica Wheeler, 12. The Indiana Fever honored Catchings, who is the most storied player of the franchise, by retiring her No. 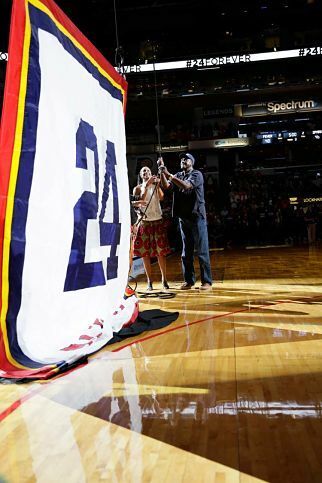 24 jersey and hoisting the banner into the rafters of Bankers Life Fieldhouse. Catchings played her entire 15-year career at Indiana. She won the regular-season MVP award in 2011, and the next year willed the Fever to the WNBA Championship. 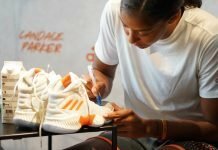 She was named Finals MVP. In the ceremony, Catchings was honored by the Fever President and the President of the Indiana Pacers. She addressed the crowd in between bouts of tears, and told them they were the reason she stayed. She and her family raised the banner together.